When you have debt, Christmas is a stressful time. With pressure to spend on family, friends, co-workers, and maybe even your barber, the season turns into more of a financial burden than a time to be merry. And even though you want to give, your budget is limited. Is it possible to say no to holiday spending without feeling guilty? Actually, it is. It’s all in your approach. I talk with Lisa Orr, an etiquette and protocol consultant, and we take a look at how to navigate the holiday season without awkwardness and forced overspending. Lisa also shares etiquette advice on common and sometimes uncomfortable spending scenarios like charitable donations, tipping, and re-gifting. Who should you tip? Lisa says that tipping typically only includes personal services like your barber, a cab driver, a waiter or waitress, etc. You shouldn’t tip professional services like your accountant, banker, lawyer or doctor, as examples. The general thinking behind this is that your tip is helping to bridge the gap between what a lower wage and the cost of living. Professional services are often compensated enough and therefore require no tip. How much should you tip? The general rule of thumb is between 15 to 20 per cent, depending on the quality of service. It’s also perfectly acceptable to tip on the bill before the tax. Beware that the payment terminals are showing the after-tax amount. If you go to a big holiday party, check to see if the location automatically adds a service charge to cover the tip. You can top it up if you want, but don’t need to double the tip. Who should you give a year end bonus or tip to? Some providers you don’t tip for each service, for example your dog walker. During the holidays you might consider giving them a year-end bonus, typically equal to the cost of one visit. Is it ever OK to re-gift? Re-gifting can be a great money-saver. The general rule is, if you can return the gift for a refund, say a bottle of wine, it’s acceptable to regift. Consumables are a little more difficult, things like tea & candy because you’re not sure where they came from. In this case, be honest with the person you’re re-gifting to. Keep in mind though, the only time re-gifting is not a good idea is if the person who gave you the gift would be offended. This is especially true with personalized or home-made gifts. Should you donate when you have a lot of debt? Over the holidays, you’ll likely be put on the spot on many occasions to donate money. This can be burdensome on your finances. Since you can’t give to everyone, set yourself a budget for charitable spending. Do you have to give to the local store or workplace charity drives? Don’t feel obligated to support someone else’s charity. Be activity about the choices of what charities you want to support. If you can’t, or don’t want to support the program, the polite thing to do is to simply state that you’ve exceeded your giving spend for the year, but that you would like to learn more about the charity so that you can consider them for next year’s planning. It’s OK to set a tipping and giving budget. Tracking how much you’ve spent on tips and donations this year can help you set a better limit for next year. Get the help of a family influencer. If you think you’ll be met with some resistance over spending or if you just don’t feel confident enough to mention it yourself, you can appeal to the “influencer” in your family – someone everyone trusts and respects. This could be your grandmother or a wise uncle. Whoever it is, open up to them and honestly explain that the holidays are a tough time for your finances. Ask them if they’re willing to bring up the topic and lead your family to changing their habits for this year or next. Be the leader for someone else. Maybe you’re not the one facing any financial problems. Maybe you know that it’s your brother, or your cousin. You can take the lead on the discussion on their behalf and set a model. You don’t have to mention who benefits from spending less. It’s just a nice way to take the pressure off of someone who is struggling. By keeping it a general conversation, you help everyone avoid awkwardness and guilt. Be creative with gift-giving. You can find ways as a family to save money. Bring up the idea of a secret santa, or buying for one person only, or only the kids. Set a price limit. Setting a gift-giving theme each year can still make this a lot of fun. Plan for next year. If it’s too late for this year, after you’ve exchanged gifts and pleasantries, you can use the positive energy to your advantage. Ask your family to reflect on the past year and what they are thankful for. In this conversation, you can ask about their goals for next year and discuss creative alternatives to spending. There is a good chance that you won’t be the only one wanting to spend less next year. Lisa also points out that even after having a money discussion, not everyone might agree to cut back on spending. In these cases, whether you’re dealing with loved ones or friends, your best course of action is to accept their decision and remain faithful to yours. If you’d like to learn more about money etiquette over the holidays or just hear some some fun ‘old style’ etiquette rules, tune in to our podcast or read the complete transcription below. Doug Hoyes: A recent survey revealed that Canadians plan to spend more on Christmas this year. They don’t have to. Although with all the obligations that come with the holiday season it’s not a surprise that they will. Well, what if you want to tighten your budget? What if you’ve got debt? How do you still give when you’ve got limited cash? Is there a proper Christmas gift etiquette when you have too much debt already? What about re-gifting? You can save money doing that but is re-gifting wrong? It’s a tricky subject so today I’m got a first time guest who knows a thing or two about etiquette. So let’s get started. Who are you and what do you do? Lisa Orr: Morning. My name is Lisa Orr and I’m an Etiquette and Protocol Consultant. Doug Hoyes: Ooh, I don’t know what that means. So what does that mean? Lisa Orr: So that means I work with individuals and schools and businesses to help them work on their etiquette and protocol skills. So that’s everything from table manners to business etiquette, international protocol when people travel overseas, doing business there. So kind of all the different topics. As I said, individual and schools and corporate. Doug Hoyes: So what is etiquette? Lisa Orr: So my favourite definition of etiquette is it’s a sensitive awareness to the feelings of others. Lisa Orr: Yeah, it’s broadly. Etiquette’s really about thinking about how your behaviours impact other people and determining how you can modify your behaviour so that everyone has a positive experience. So it’s this kind of dance that we do with each other to … also to conform to, kind of, social expectations that we do have within different cultural groups. Doug Hoyes: Well and we’re social people, so if you can’t get along with others then you’ve got a big problem and I guess that’s where etiquette really helps out then. Lisa Orr: It can really help. Doug Hoyes: Knowing what you should do. Okay, so let’s hit some actual real stuff here, because I don’t understand, you know, the diplomats and all that, that’s not my thing. So number one, tipping. You know what tipping is, right, you’ve heard of this, right? Doug Hoyes: So what’s the general rule of thumb? You know, is it okay not to be generous with tipping around Christmas and, you know, what if you can’t afford to do it all so … are there some alternatives? Like, what is your general approach to tipping? Doug Hoyes: That’s why I started with it. Doug Hoyes: So I’ll hit you with the hard ones, right off the bat. 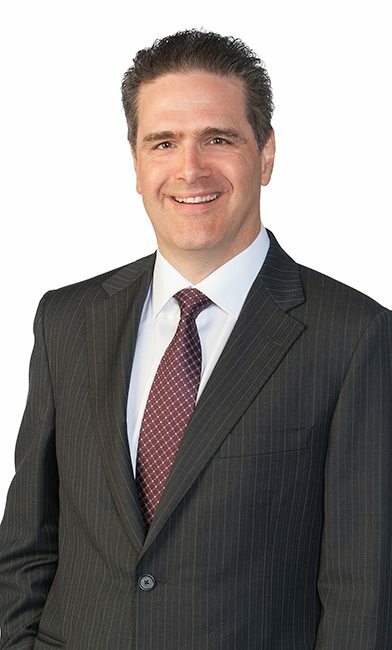 Doug Hoyes: – not to divert the attention to us accountants, but why? Lisa Orr: That’s a good … and part of it’s about social convention. Doug Hoyes: It’s just the way it is. Doug Hoyes: And I guess part of it as well, I don’t tip my doctor because they guy’s making pretty good money. My accountant’s making pretty good money. Is that a big component of it? Lisa Orr: I think that’s part of how that behaviour evolved, was that in service-based industries the reality is tipping does manage or make up for a difference in wages. People aren’t being paid quite as much and so we feel this obligation to give them a little extra, to make up for the fact that they’re not really being paid what they could be. And in some countries they’ve actually managed that by raising minimum wage and including service charges so that it’s no longer the consumer’s obligation to tackle it. But in Canada we’re not quite there yet. Lisa Orr: So we still have to focus. Doug Hoyes: Okay, so tell me some rules of thumb. Lisa Orr: So the one place where it’s really hard to … where you’re really committed, is in the restaurant industry. So there’s so many people that rely on a tip, when you give a tip. It’s the one area that there really isn’t a lot of wiggle room, and that number’s been going up. Historically it used to be … there was this expression tip the tax, in Ontario, but now it’s much … it’s closer to 18%, is what you’ll see for reasonably good service in a restaurant. Lower end would be 15 and then in some cases you’ll see up to 20%. Doug Hoyes: So if I tip 20% they’re going to think hey, we like this guy. Lisa Orr: That’s the upper end. Doug Hoyes: Ah, I see. Lisa Orr: – so when they do that percentage calculation, and if you’ve had a big group and you’ve had six people out for dinner, and you tip 18% on top, on top it can start to become … that’s not what you’re meant to tip and it’s one thing to be generous, but it’s another thing to be unintentionally generous. Doug Hoyes: – which is a lot less than 20% of the total number. Lisa Orr: It is and I think that it’s really important to … because people are afraid to ask and I think it’s always important. I’ll go back to if I’m not sure I’ll ask my waiter or my waitress, can you just confirm for me where this … you know, what is this percentage? Because sometimes the machine will ask you just to tip a percentage. Doug Hoyes: And so what happens when … because I’m sure you’re always going out with 20 friends, right, and they just say oh, you got 20 people, we’re tacking on an extra, you know, automatic gratuity or something. Doug Hoyes: Well, how do you handle that? Lisa Orr: So I think if you’ve got a big group it’s reasonable to expect that they’re going to add their gratuity. The thing that I do ask a restaurant, because I book … I often organise groups like that, I make sure that they’re adding that 18% on the pre-tax amount, because that’s really what they’re supposed to be doing, rather than what the payment gateway makes it easy to do. Lisa Orr: – typically when they say we’re going to add an 18% service charge. So it’s just making sure that they’re doing what they’ve agreed to do. Doug Hoyes: So on the bill, if they do … if that was the pre-agreement then it would say, you know, subtotal, here’s 18% , but then the tax should be on not the 18%. Lisa Orr: It should be a separate … it should be a totally separate amount that’s not taxed. Doug Hoyes: – a decent restaurant. Doug Hoyes: – get a tip? Lisa Orr: – and so that they get a good haircut, which is also important. Doug Hoyes: That’s my secret right there, yeah. Lisa Orr: So they’re kind of in the 10 to 15% category. Sometimes people will do … I mean, there can be a range. I know people who tip more, I know people who tip less. A good rule of thumb, if you’re not sure, if it’s a new stylist, is to ask … if someone referred you to them ask them how much they tip and that’ll give you an idea of where it falls, just so you don’t make a misstep. Getting that information can be hugely … because otherwise you might be over tipping all the time and never know it. Doug Hoyes: Or under tipping and they’re mad at you and you get a bad haircut. Lisa Orr: See, both are a problem. Doug Hoyes: We don’t want that. Lisa Orr: Yeah. And then so there’s also this driver. So if you’ve got a taxi, they’re kind of in the 10 to 15% range. Some people don’t quite qualify for tips but you might see, kind of, end of year bonuses. So someone who’s a dog walker or someone who provides regular service to you, you may not give them tips all the time but you might include a bonus at a year end. So it’s kind of like a tip but not a regular tip per service. And those are typically the cost of one visit. So let’s say if it was a dog walker who comes to you all the time but you don’t really tip them, you might leave them a small bonus of the cost of one visit. But those definitely fall into the more optional categories. Restaurant is very hard and fast. Driving services, hairstylists are a little more flexible, but then you have some more leeway in those bonus categories. Doug Hoyes: So if I can summarise that all as a rule of thumb the answer is ask. Doug Hoyes: You know, find out. So, okay, what is everyone else … I don’t have a dog walker so I don’t know what that is, but ask around, okay, and even with the service provider, like you said. So if someone was … if I was to refer someone to you … I think that’s an excellent angle. Doug Hoyes: If I was to refer someone to you what kind of tip should I tell them is standard here, and that way at least you know where you’re at in the thing. Okay, so that’s tipping. Now an even better topic, I think is re-gifting. Doug Hoyes: Okay? So someone comes and gives me a gift and, I don’t know, it’s a bottle of wine, okay, and I’m not a big drinker so I’m not going to drink it. Well, I’ve got to go to a party next week, why don’t I bring that same bottle of wine? Makes sense and is a moneysaving technique that’s fantastic, because you’ve just paid zero for a gift. Are there any problems with that? Are there any rules I should be following? Where’s that going to backfire on me? Lisa Orr: Yeah, so with re-gifting a good rule of thumb is if you could buy that same object today at the store then … and they could return that object. So a bottle of wine is a great example because, in theory, you could take it back to the LBCO, even without the receipt, I’m pretty sure, and just take it in. So then you could absolutely re-gift that. If it’s something that you couldn’t do that with, so let’s say it was candles or some kind of consumable, like a tea, something that you couldn’t just purchase that way, then that’s where it starts to get tricky, because then it’s hard to say … when a person receives the gift you don’t … you can’t really vouch for the lineage of that item, right, because maybe it’s Aunty Martha’s jelly and you’re not quite sure about that. So I feel like that’s where … for me that’s where the line is. And so in those situations … it’s not that it’s a no, but you might say … so often what I’ll do … I’ve been in that situation. So I was given some candles but I … anyway, I couldn’t use those candles and so I gave them to a friend at a party, but I said I actually received these as a gift and I love them, but I couldn’t use them and I thought you’d really enjoy them. So I can still use them as a gift, but to be on the safe side, if I give people context as to how I came into that lovely present then it gives me a little more flexibility. Doug Hoyes: – okay, well, probably not a problem. If it’s Aunt Martha’s jelly. Doug Hoyes: We all know Aunt Martha’s jelly so you don’t really want somebody to be dying because you gave them this gift. But if it is Aunt Martha’s jelly and you say look, my Aunt Martha made me this jelly and she has great jelly but, you know, we’re all on the Keto Diet now and I can’t eat this jelly, you know, you’re not on that diet, would you … in that case you’re probably okay. Lisa Orr: And I made it just for you. 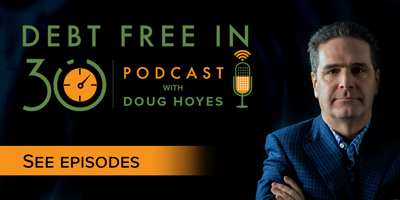 Doug Hoyes: – and given it to you … just for you and you’ve given it away. Doug Hoyes: Or some other special-type item that I looked all around for that particular thing and gave it to you and now I find out your next-door neighbour has it. Lisa Orr: Yeah, so if giving it is going to hurt the giver, substantially, then you may want to reconsider. Doug Hoyes: Okay, so tipping, yes you have to do it but re-gifting yeah, you can do that too. So that’s good. Now this is a show about debt, you know, Debt Free in 30, that’s what we talk about. So I want to talk about … people who are listening to this now, who don’t have a lot of money, maybe they are in debt, but okay, it is the holiday season and, you know, we’re all getting together and, you know, the way we’ve always done it is my family gets together and we get gifts for everybody or we have a … we draw names or something like that. Well, you know, I can’t really do it, from a financial point of view. How do you broach that subject? Doug Hoyes: Oh, there’s a taboo. 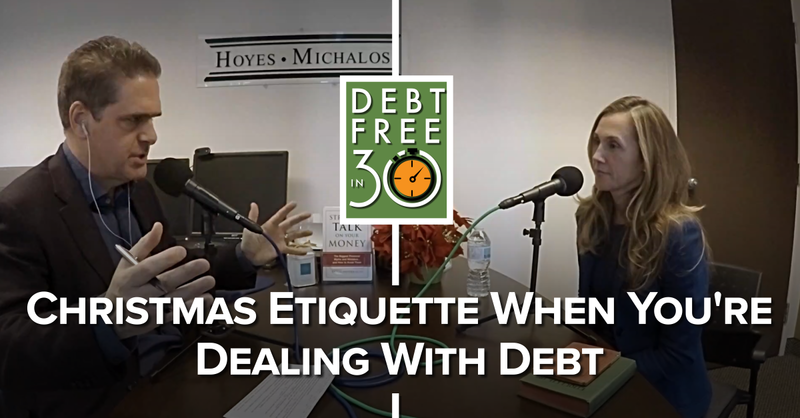 Lisa Orr: Yes, like the etiquette around money is one of those areas that people get really uncomfortable talking about. It’s why they don’t ask about tipping or ask about re-gift … we just sort of get really concerned. And I think when we’re transparent and authentic, I mean it’s our family … of all the people that you should be able to be transparent and authentic with it’s probably them. So my advice is always to have a conversation. Typically it’s nice to find … I don’t know, in my family there’s influencers. To find a family member that’s kind of got the ear of the group and someone … you know, sometimes it’s the matriarch or patriarch, but it doesn’t have to be, and have a conversation about your situation and say this is where I am. I really can’t afford to do gifts this year. And then have a conversation about how you might solve the problem. So you might have some ideas, they might have better ideas. But then at least you’ve got an alias in getting to your goal. And also an alias who’s empathetic, who’s saying, you know, thank you for telling me. I wouldn’t … because most of the time your family doesn’t want to put you into debt. We’re just trying to find a way to celebrate together and enjoy the holidays. Doug Hoyes: It’s a fun thing, yeah. Lisa Orr: It’s supposed to be but once you’re putting yourself in a position where you’re worried about paying your rent or your lease next … you know, in January, just because you got everyone gingerbread houses, I mean that’s not the goal for anyone. So I think once you kind of … once you shine the light on it then you can start … and then there’s all kinds of creative ways, because it is supposed to be fun and a great time to celebrate family. Then you can get creative about how you celebrate without spending money. Doug Hoyes: Okay. And so I’d like to talk about that. Now, can I re-gift a gingerbread house? Doug Hoyes: Okay, that’s the key. Lisa Orr: That’s the key. Doug Hoyes: So obviously I’m not re-gifting if I made it. If somebody else … yeah, okay, so probably no on the gingerbread houses. Okay, so creative ways. So, again, we’ve got this tradition where, you know, the ten brothers and sisters all buy presents for all the brothers and sisters and kids and everything and it’s just too much. Doug Hoyes: So I go talk to the grandma, who everyone respects and loves and got the ear of everyone and she says yeah, no, there’s a couple of other people in the same situation as you. Okay, that’s a good sign. But we still want to have fun over Christmas. What could I suggest then as an alternative? Lisa Orr: So one thing that works really well is to … so using kind of Secret Santa or single gift solutions is a much nicer thing to do. Because I come from a huge family. So my mum has six brothers and sisters. I’m 1 of 17 grandchildren. We are massive. Doug Hoyes: You’d all be broke. Doug Hoyes: Christmas is the best thing in the world when you’re five. Doug Hoyes: Like, there’s nothing better than that, right? Lisa Orr: So for the little children, and then we set a theme and price limits. So we made it … and the goal was to make the price limit … you made the price limit really low. Like, typically it was sort of, like 10 to 15, really an affordable price point and then you’d set a theme and you make it fun. And then … I mean, you can do with adults too, and I always think the lower you make the price limit the more interesting the gifts are. Doug Hoyes: Because you’ve got to put some thought into it. Lisa Orr: Absolutely. Or you can get super creative and say it has to be, kind of, an exact dollar amount, and that makes it really fun too. Doug Hoyes: And so you’re picking a theme. Give me an example of a theme you could pick. It could be, like … it’s got to be something to do with sports or it’s got to be something to do with food or it’s got to be something like that? Lisa Orr: So those kind of … you might have common interests as a family, so let’s say you all … let’s say everyone watches football and you all love football or if there’s … I mean, it doesn’t have to be that specific. Or if there’s something that you love to do over the holidays, if you everyone likes making … liking cookies, maybe it’s different cookie cutters. Maybe it’s … you know, there’s all different kinds of … it all depends on, kind of, interest. That maybe you’ve got a family of quilters. Who knows what … every family has these kind of different hobbies. Doug Hoyes: Yeah. Well, how can a cookie theme go wrong? That’s, like perfect. Doug Hoyes: How do you know who doesn’t like cookies, right? Lisa Orr: – less cookies. Doug Hoyes: There’s no point in healthy cookies. That’s just ridiculous. Okay, so you are replacing everyone’s got to spend a lot of money with everyone’s got to put some thought into it, but there are ways to do that. Now, are there ways to do it where you’re spending zero? Lisa Orr: 100%, because it’s not … so all that you’re doing then is you change the paradigm. So then you say, like you have to spend zero dollars. So when you’re doing this game … and so when you do that … so you might use, like maybe I’m going to write you a letter and I’m going to write … or make you a poem about how amazing you are. You can find ways to … I’m a big fan of silly poems. I like to write them. There’s no good reason for this but I find they’re great ways to celebrate people and do cute things. You could make collections of old photographs, as an example. There’s different ways to show people that you care about them, that you want to celebrate the holidays, that might require some of your own time, so there’s dollar value to that, obviously, but no actual kind of output of dollars. And often those gifts are the most heartfelt, which is … I mean, ironically, it doesn’t take a lot of emotional energy to hit … click on, you know, the online store. Lisa Orr: Whereas to really think about a person or to find a photograph or to write about a memory that you had, that’s a lot of energy and caring. Doug Hoyes: Yeah, buying everyone the same kind of coffee mug well, okay, boom, I order 50 of them and here they all are. It doesn’t take a lot of thought. Whereas what you’re describing does. So what do you do then … so I think these are very practical answers. And so for people who don’t have a whole lot of money or maybe have tons of money but don’t want to be spending it on stuff that’s going to be forgotten in two days, these are obviously practical things. Now what do you do in the case, then, where either you yourself have debt, and I guess you’ve kind of answered that. Well, you know, we have discussion about it. But what about the case where that other family member, I know they’re suffering and I know they’ve got a bunch of debt, you know, maybe it’s your brother-in-law or whatever, and I don’t want them to be uncomfortable, how do you broach that subject? Lisa Orr: So I think in those situations you have an opportunity to kind of be a leader for your family and set a model. Because if you think that every … and typically if you’ve got one family member that’s suffering with debt the reality is … I mean, most of us could benefit from spending less over the holidays. And so if you know that that’s a situation you’re … because, you know, as a team, your family’s going through this, really, together. If you can say hey, you know what, I think we’ve all maybe spent a little bit too much this year, why don’t we all spend less, rather than … if you know that’s going on … because I know if I was in that … and I always think if I was in that position how would I feel if someone helped me out that way? Didn’t call me out and say I know you’re in trouble. Because sometimes if you … and not everyone’s ready to talk about their debt right away and often they’ll … you know, there may be a situation where they want to spend more to kind of cover up the fact that there’s stuff going on. So that way it takes all the pressure off and it’s kind of … and that’s really the gift you’re giving them for the holidays, to say you don’t even have to talk about it, we’re just going to take this all down a notch this year and then, you know, if we win the lottery next year we’ll talk about it. Doug Hoyes: I like that, be a leader. Doug Hoyes: – this year. Okay, well you’re giving me something to do, I’m participating. I think that’s my sister’s job. So she won’t want you to take that then. And is that the same answer then with gifting in general, when you’re talking with, you know, your friends who … you know, well, I get together with my friends every year and we always do something, but I’d like to take that down a notch too. Is it exactly the same, be a leader and have that conversation with them? Lisa Orr: I think so. I mean, the only challenge, and this comes up quite a bit, is there’s often … often people run into the situation where there’s one person who says well, I want to … I still want to go here for dinner or I still want to spend this amount of money, and that’s the only challenge you can run into when you’re trying to lead this more economical … and it’s … I mean, there’s this double benefit of when it’s … even though it’s sort of economically responsible or financially responsible it also shifts the focus to the right topic. It makes you focus on the people. It makes you focus on spending time, rather than the commercialism, which is what I love about taking that kind of approach, but I think the thing to be mindful of is if you do get someone who’s not onboard, who’s just like I don’t care, I still want to buy gifts, I still want to get gifts, the thing to remember is they can choose to do whichever they’ve done. Doug Hoyes: Well and this podcast will come out before Christmas but … you know, shortly before Christmas, so this may be the kind of thing where well, that’s what we’ve done in the past, maybe this Christmas is when we have the discussion about what we’re going to do in the future. Doug Hoyes: That, you know, this was great but, you know … I mean, I remember when my kids were little, there was one year we got them tons of stuff and the best thing they got, the boxes. Lisa Orr: Always, it’s always the favourite. Doug Hoyes: The boxes, those were awesome. And so we realised well, if we’d gotten them two or three things and a bunch of boxes that would’ve been the greatest … so, you know, we realised … but you have to live through it and make the plan for next year. So this is the year to make the plan for next year if it’s too late for this year. Lisa Orr: And that’s a great time to … anytime you’re in the moment is a great time … my strategy always, when I’m trying to make a change with my family or consider a new approach, is have it in the moment. When that holiday is happening … that goes for really any holiday. When a birthday’s happening say hey, you know what, this was amazing but next year maybe we could … I know my brother and I, when we first started to do … so he and I do a booze exchange. We used to buy each other presents and it always got complicated and so we decided every year I get him a bottle of wine and he gets me a bottle of wine. And that’s … and so we’re flat. And it’s … because we would’ve bought the bottle of wine anyway. Doug Hoyes: Yeah, it’s all good. Lisa Orr: But it’s super fun because we both get to give each other a bag and everyone’s happy. Lisa Orr: But it’s funny, we had the conversation one holiday because, you know, I wasn’t sure what to get him and he wasn’t sure what to get me and we’re grownups and we went you know what, why don’t we just do this? Doug Hoyes: Do it now then. Doug Hoyes: And so this year, is he getting red or white? Lisa Orr: I don’t … that one I don’t know yet. Doug Hoyes: We’re not … okay, so he’ll have to wait until Christmas to find out. Doug Hoyes: So okay, two more questions I want to ask you. Should I set a budget for, you know, tipping and gifting and Christmas in general or are there other strategies I should be thinking about instead of that, to make sure I’m conserving my cash? Doug Hoyes: To say yeah, I’m not going to tip more than a hundred bucks this Christmas. Well, last Christmas it was 500 bucks. You’re totally out of the loop here. Lisa Orr: Yeah and then you’re going to … many people upset. So I always think step one, track your behaviour, see how much you actually … in kind of your normal course, what you felt made people comfortable. Figure out how much that was and then you can adjust your behaviour for next year. So maybe that means that … maybe there’s less services, because tipping is really a function of how many services you have. So maybe say well, maybe I’m going to out for dinner less or I’m going to make more food at home or I’m only going to get my hair cut twice a year. I mean, whichever things you’re going to do to cut back, because tipping, really, is just an extension of your broader budget. So I always think it’s important … you can’t start … I find it’s very difficult just to cut cold turkey, without any information. Doug Hoyes: So there has to be some thought to it. Okay, now here’s my pet peeve. You go to the grocery store and they ring it up and they say oh, would you like to contribute $2 to our own grocery store charity, and I’m always thinking … well, I’m an accountant, okay? Doug Hoyes: I understand how taxes work and I’m going no, no, I know what’s happening here. I put the two bucks in and at the end of the year the grocery store can say hey, we donated a hundred thousand bucks to charity, which of course they didn’t, it was my money, and then they get the tax break for it and that just ticks me off. I would prefer to decide what charities I’m going to support, research them, make sure they’re, you know, in alignment with my values and everything. I would like to decide how much I’m going to give them. I would like to send the money myself. And then, of course, I would like to get the tax break for it too. That’s secondary, in my view, but then that’s also important. So my answer, when I’m at the grocery store, is no, I’m not supporting, you know, the big bad grocery store chain. Now, I feel kind of bad having that discussion with the cashier, who’s sitting there going look dude, I’ve got to ask the question to everybody or else I get fired. I don’t like asking it anymore than you do, but that’s just the way it is. So is my mentality wrong on this or, you know, how would you handle the same thing? Doug Hoyes: Yeah, like you’re a horrible person for not supporting our charity. Lisa Orr: I’ve been asked, like how could you not want to support this charity? It helps these people. And I’ll say, you know, I really wish I could. Unfortunately because you don’t give tax receipts I can’t. So I can’t factor it into my annual giving budget. But, you know, if there were tax receipts I would definitely consider it. And that’s actually how I tackle giving all the time. When it comes to giving, my family, we set an annual giving budget. We have … we know exactly, because it’s how much tax receipt you’re going to get. We have our different charities and we research them and they receive their … and that way at least I know okay, so for all the phone calls, for all the people who reach out, that’s how I tackle them. Because it’s not that … if you gave to everyone there wouldn’t be anything left to give. Lisa Orr: And so you have to prioritise. Doug Hoyes: You got to pick your spots, yeah. Lisa Orr: Yeah and I don’t think people should feel badly about that. I think when you … making active choices about what charities you’re going to support means that you are actively helping people versus passively helping them. And I feel like they should be … I mean, selfish … I feel proud of actively making choices about who I support versus a passive support, means you don’t really know who you’re helping or why you’re helping them and charities are amazing but not all of them help in the same way. And so you can, when you do your homework, find charities where your dollar can really make a difference, and I feel like that’s part of … that’s just kind of what we’re doing when we’re giving, is doing a little homework so we can make our dollars work. Lisa Orr: And it actually really helps. Especially this time of year, sometimes there’ll be people coming into the office and say oh, there’s a drive or I need to support this team or … and there’s some pressure in the workplace to support different charitable situations. So that can actually be a way to manage that social pressure, which can happen sometimes … I mean, it happens all through the year but it’s a nice way to manage that pressure around charitable giving. Because if you say you’ve got your own plan it’s hard for people to say well, whatever on your plan, support me anyway. Doug Hoyes: We’ve already decided on our annual giving, yeah. Lisa Orr: Yeah and there may be new charities that come in and others that go out or your budget might increase, but I think … and it just makes it … I think when you’ve got your language as to what you’re going to say to people when they come to you, instead of panicking and feeling guilty, instead you feel confident and know exactly … and feel good and proud of the choice you’re making. Doug Hoyes: – because this is one of your hobbies, of course, collecting old etiquette books. So give me an example of some etiquette advice from, you know, yesteryear, as it were. What are the kind of things that, you know, I would have learned in the past? Doug Hoyes: Yeah, when I started as an accountant, 30 years ago, you wore a suit. Doug Hoyes: That was it. You wore a suit. So you didn’t have to … it didn’t matter if it was Friday or Monday or the middle of the summer, whatever. You wore a suit. And it was probably a white shirt and a dark suit and that was that, so … but not the case anymore. Lisa Orr: And the number of dresses that they have. And then also around the different types of … like, the big [unintelligible 00:31:49], with men in tuxedos. So, boy … this is a list of things that boys should be aware of. And this is actually an etiquette book for children. Lisa Orr: It’s the Etiquette Junior book. Lisa Orr: This one is the American book. Doug Hoyes: The American book, okay. Lisa Orr: My Canadian version was … I have this wonderful Canadian book from the Toronto District School Board that was … it’s unfortunately so fragile that it doesn’t transport well. Doug Hoyes: We don’t want that. We don’t want that. Lisa Orr: I might have lost it by the time it got here. Lisa Orr: So this one is American, but one of the things I love is things that boys should be aware of. So tuxedos before six, because obviously all boys have a tuxedo. Doug Hoyes: Yeah, so don’t wear a tuxedo before six? Doug Hoyes: Okay, that’s very good advice. Lisa Orr: Grey vests with tuxedos. Coloured handkerchiefs with tuxedos. Doug Hoyes: Can’t do that, no. Lisa Orr: That’s apparently a disaster, loud checks. Lisa Orr: I mean, it’s shocking. Doug Hoyes: Yeah and this is advice for boys? Lisa Orr: This is for boys. Doug Hoyes: So this isn’t 40-year-old men, this is, you know, you’re ten years old, make sure you’re not wearing a tux before six, wow. Doug Hoyes: Hey, you got underwear on, fantastic. Doug Hoyes: It’s all good. So … wow, the world has certainly changed. So that’s … I’m sure … we should do five shows just on old etiquette books. So what final advice, then, would you give our listeners? And, I mean, you’ve given some really good practical ones here and I think, you know, being active rather than passive, being a leader, you know, thinking, those are all pretty good things. How would you summarise it? Lisa Orr: I think the key to being successful and managing, kind of, these sticky situations is to never be afraid to ask questions. And don’t be afraid of being judged. I think that’s a thing that holds so many of us back, is that we’re so afraid of being judged for what we don’t know, and the best way to solve the problem of what you don’t know is to ask and then you do know. And I think most of the time when you have the question other people have the question; and as long as you ask with humility and, kind of, an … and clearly are interested in finding the answer, most people are willing to help and you can get to a place where you feel comfortable with what you need to do and, typically, people are happy to have helped you get there. And I think that’s … I think once you feel like you can ask for help then all these topics that seem scary, that seem taboo, where you’re afraid of being judged or being ashamed, kind of that all goes away and all these social things now become really fun things, rather than scary things. Doug Hoyes: Yeah, ask. That makes perfect sense. Well, it’s an excellent way to end it. How can people track you down? Do you have a website? Where can they find out more about you? Doug Hoyes: So that’s Orr with two Rs? Lisa Orr: O, double r, that’s the one. Doug Hoyes: And you’ll have to look up how to spell etiquette people, because we can’t do that for you, orretiquette.com. Lisa Orr: That’s the one. Doug Hoyes: That’s how they can find you. Lisa, thanks very much for being on the show. Lisa Orr: Thank you so much. Doug Hoyes: Thank you. The holiday season is a difficult time of year if you’re in debt, so hopefully all the stuff Lisa said today will help you survive and thrive during the holiday season. I think we’ve had some very good practical advice. So that’s … I think that’s been fantastic. That’s our show for today. A full transcript and links to Lisa’s website can be found on the show notes, over at hoyes.com. That’s h, o, y, e, s.com. Thanks for listening. Until next week, I’m Doug Hoyes. That was Debt Free and 30.